Since 2014, the Fresno County Sheriff’s Office has made presentations of its Seconds 2 Survive program to several local schools and businesses. It primarily focuses on active shooter situations. A big goal of the course is to make people think ahead of time about how they will react in an emergency to ensure they become a survivor and not a victim. The program also identifies response plans by examining the students’ specific facilities. A Seconds 2 Survive session is taught by two deputies and typically runs 90 minutes. It is available free of charge to Fresno County residents / organizations. To make a request for the program, please fill out the form. In the message field, also include your phone number and organization’s name. We will then get back to you with scheduling options. Thank you. 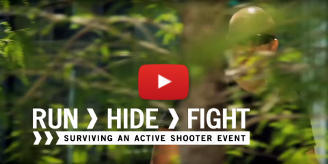 Run, Hide, Fight is an exceptional video about surviving an active shooter event which is featured and discussed during the Seconds 2 Survive presentation. Click here to watch. Please include your organization's name and phone number in the message, and we will get back to you shortly. Thank you.